We may be most familiar with the palm branch as a symbol of Christ's Entry into Jerusalem on Palm Sunday. During the Church's liturgical celebration on that day, the faithful bear palm branches to herald Christ's kingship, mirroring the crowds that acclaimed him as the King of Israel on the first Palm Sunday. In ancient Rome, the palm branch was used as a symbol of victory; the Christians appropriated this image to symbolize the martyr, whose death, paradoxically, is his triumph. In this way, the martyr's palm may be linked to the branches of Palm Sunday. As the crowds laid the palms before Christ, so the martyr lays down his life as an offering to Christ the King, proclaiming His glory. It is worthy of noting that, in Christ's time, the palm branch represented the nation of Israel, God's chosen people. 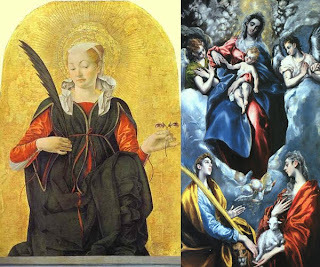 The images above - Fracesco del Cossa's Saint Lucy and El Greco's Madonna and Child with Saint Martina and Saint Agnes, both at the National Gallery of Art in Washington, DC - show these female saints holding a palm branch as a sign of their martyrdom.